Everything that is delicious about a slice of pizza pie, like pizza sauce, cheese and pepperoni, but in a portable pie in a buttery, flaky crust. If you have seen my blog post for a while you can see that I love pizza. I can eat pizza for every meal of the day. I've been like that since I can remember. It has to be the perfect food. These little guys have a yummy flaky crust that parmesan cheese in it, yes I know, to give it the hand pie layers of flavors with the crust then the center with pizza sauce, cheese and toppings. Choose topping or meat that you like. The pizza hand pies are kid-approved and you can make a batch of these and freeze. That is what I did for my niece and nephews. Please note this is a double recipe, this can easily be halved. 1. Freeze butter for at least 2 to 3 hours, the longer the better. You want the butter to be rock solid. Pour water into a cup and chill, not frozen just really cold. 2. In a large bowl, add flour, salt and sugar. With a cheese grater, using the large eyelet, grate butter into flour mixture. Gently toss butter into the flour in between grating the butter, after grating all the butter grate the parmesan cheese into the flour and toss. 3. Gently toss the flour and parmesan cheese together until well incorporated. Slowly add in cold water 3 tablespoons at a time. Mix with your hands until dough is slightly sticky but still have flour leftover. Tip bowl over on a floured surface and gently kneed dough until together. Divide dough into half and roll dough then sandwich together about five to six time. That will help get nice flaky layers. 4. Cover dough in clingwrap and freeze for at least 2 to 3 hours or overnight is best. You want the dough to be really cold. 5. Roll one half of the dough to about a 1/4 inch thick. Cut out dough in a rectangle shape or any shape your desire. Cover two cookie sheets with parchment paper. Spoon on 1 tablespoon of pizza sauce, 1 tablespoon of cheese and toppings. Top with another piece of rolled crust, press edges closed then goes along with a fork sealing it. Place pies on prepped pans. 6. Brush hand pies with egg wash, grate parmesan over pies and chill for 30 minutes. 7. Preheat oven to 350 degrees and bake pies for 18 to 22 minutes or until lightly golden brown. Rotate the pans halfway through. The first batch may take longer than the second so keep an eye out. Let the pies cool for 5 minutes before consuming. If not consuming right away, let the pies cools completely and either keep in the fridge for 5 days or freeze for up for a month. Oh these look delicious!! There is a restaurant back in my hometown in Illinois that makes these and they are SO good I never thought to make them myself ! Sounds so good! I do like tha it has a Parmesan flaky crust. I bet it’s a hit with kids! 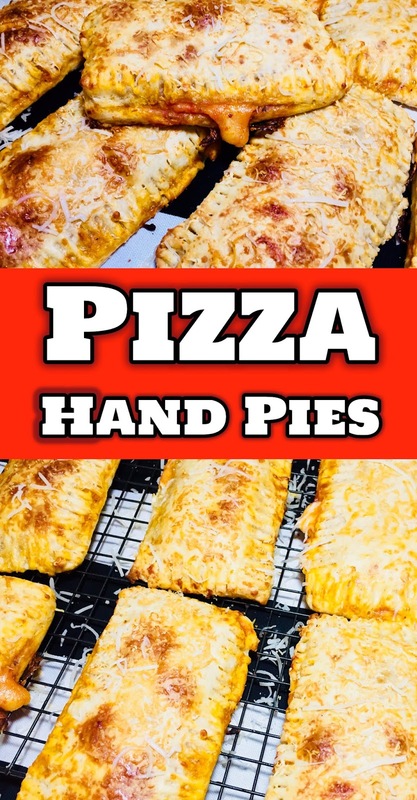 These pizza hand pies look really delicious. They would make a great go-to lunch or a handy addition to party food. Thanks for sharing this with us. These pizza hand pies look delicious! Not only will my grandchildren love these but I believe I will as well. They are just the right size and could be used for dinner, picnicking, movie night just about anytime. This looks so tasty and the recipe looks quite easy to follow too! Definitely will try it! These look amazing! I am definitely adding this to my family's meal plan. Goodness me do these ever look delicious... and so easy to make. Thanks for sharing! This looks so mouth watering. So the pizza game is slowly evolving. Glad to see that. This is an easy to make recipe. Being a vegetarian maybe I should replace pepperoni with mushroom. I will try this at home this weekend. Thanks for sharing a detailed recipe. This looks delicious. Thanks for sharing the recipe. Will try for sure. The cheese oozing out makes it so tempting. These look so good! Perfect for a movie night in or to share with friends!! WOW! These look so delicious and perfect to have on hand on nights you don't want to cook - I love the idea of freezing them for later. I too, could eat any kind of pizza every day. Thanks so much for sharing this delectable recipe! It looks delicious and super easy to eat. It looks more filling and more 'clean' to easy comparing to average pizza. I think it's great option for game day/night with friends. These look incredible! I bet my kids would love some hand pies for dinner. Thanks! These look and sound so delicious! We seriously just tried to make calzones the other night and my husband was not so impressed. I need to give this recipe a try! I think the homemade parmesan crust would be a hit in our family! These sound sooooo delicious! I want to try these this weekend -- I just recently learned what a calzone is and I'm craving all things pizza! Sweetie, the idea of portable pizza is a very original one! And it looks absolutely delicious, I will try this at home for sure! These look like they would be a lot of fun to make with my kids! These look so good! I would never think to make them at home, but it looks easy enough! OMG, just looking at these are making me hungry! I'm definitely saving this recipe to try in the future, thank you! These pizza pies look so delicious. I want a slice now. Thanks for sharing. this looks amazing. I think the possibility of personalization for each of my kids is awesome too. Perfect for packed lunches or road trip snacks! Yummy. These look so delicious. And what a perfect size, too. I'm sure my kids would love this different take on pizza! Wow this sounds fantastic. I don't eat dairy but if I did I would cook these up! Super fum for a movie night. ummm WOW. if only I could just virtually reach out and grab one of those for luch right now. yummmm! I have never thought of something like this before, but it looks so good!! Simple and delicious, I'm definitely going to try this out this weekend. Thanks for sharing! These are so good! We've made a similar recipe in the past and it's one of our easiest and favorite meals.